Erythrina is known as the red genus and E. caffra is widely loved for its warm red to scarlet-coloured flowers, which appear from the cold winter months up to spring. Its popularity can be ascribed to its ease of cultivation and long flowering period. The coastal coral tree is an ideal garden plant and, because of its unique appearance, has continued to draw the interest of botanists, horticulturist, nature lovers, and the general gardening public for many decades. The generic name Erythrina, originates from the Greek word erythros which means red and alludes to the bright red flowers and seeds. “Caffra” is derived from the Arabic word for an unbeliever, and as used in older botanical works generally indicates that the plant was found well to the south of the range of Arab traders, that is, along the South-Eastern seaboard of South Africa. Carl Thunberg, who is also known as the father of South African botany, gave the names in 1770. The genus Erythrina is a group of shrubs and trees which have their origin not only in South Africa, but also the West Indies, Brazil, and Australia. The genus contains just over 170 species, six of which are found naturally in South Africa. These are Erythrina caffra, E. lysistemon, E. latissima, E. humeana, E. acanthocarpa and E. zeyheri. The latter two are small to medium shrubs with thick, fleshy, underground stems and more suitable as grouped plants or container plants in the garden. All South African erythrinas are noticeable and well established in cultivation primarily for their striking flowers. Most species in this genus have been loved by many different peoples since the early days of South African history. Their popularity also extends to gardens abroad, for example in the USA and Europe, where this species was cultivated under the name E. constantiana (Mich.). It was also probably the first wild tree species planted in groups in the gardens of the Eastern Cape. A solitary coastal coral tree near the present site of Port St. Johns figured in one of the very early Cape journals, that of Jacob Van Reenen, whose party journeyed into the then unknown east in search of the wreck of the Grosvenor. The leader, Jan Andreis Holtshausen, who died of lockjaw, was buried under the tree on 24 November 1790. His friends carved their names upon its trunk. 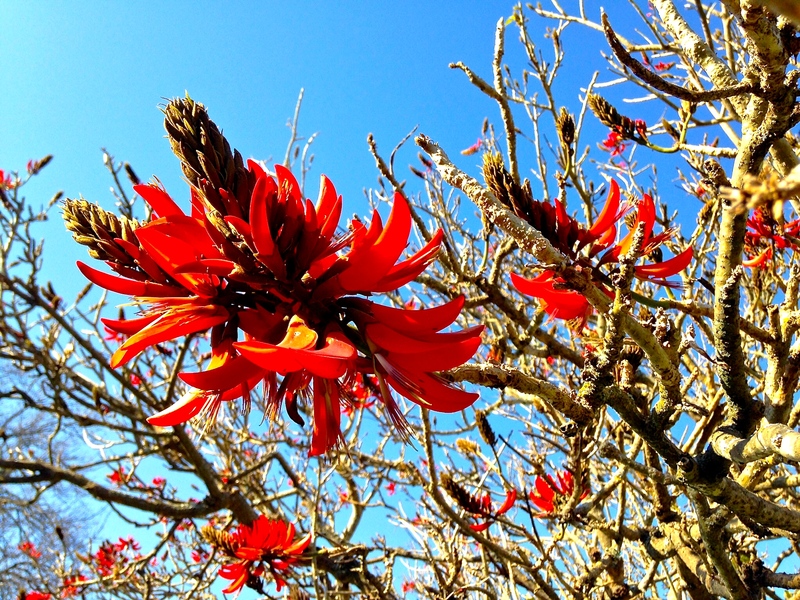 Both birds and flying insects pollinate coastal coral trees. The flowers of Erythrina caffra do not produce any fragrance, and only colour, in combination with the reward of nectar, which the tree produces in abundance, is used to attract pollinators. Birds such as Redwinged starlings (Onychocnathus morio), bulbuls (Pycnonotus sp. ), yellow weavers (Ploceus subaureus), sunbirds (Nectarinia sp. ), orioles (Orioles sp. ), and many others feed on the nectar and red blossoms and can be seen by the hundreds visiting these trees in the early spring. The flowers appear before the leaves and this may well be a strategy for visible advertisement to attract as many nectar-feeding birds as possible. The shape and design of each flower is in such a way that the stamens are exposed and therefore pollen transfer by birds and insects takes place with ease. It is estimated that each flower may hold as many as 7-10 drops of nectar and each flowerhead may hold up to 80 florets. The red berries are also an important food source to many seed-eating birds. Birds therefore not only pollinate the flowers but also aid in seed dispersal, which ultimately impacts on the natural distribution of the species throughout its entire habitat range. The seeds are also fed on by developing larvae of many winged beetles, which lay their small yellow eggs inside the immature pods. Borers also sometimes attack trees and do considerable damage, particularly to young trees. The dead wood of the coral tree is soft and is an ideal nesting places for birds such as the Pied barbet (Tricholaema leucomelas), and Cardinal woodpecker (Dendropicos fuscescens), while the hollow trunks are often inhabited by swarms of bees. In South Africa, Erythrina caffra is seen as a royal tree: it is a much respected and admired tree in the Zulu culture and is believed to have magic properties. Specimens have been planted on the graves of many Zulu chiefs. 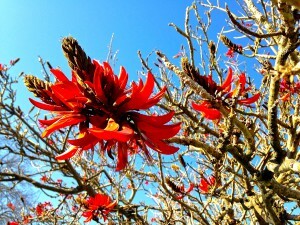 In parts of the Eastern Cape, local inhabitants will not burn the wood of Erythrina caffra for fear of attracting lightning. They were also planted as living palisades around the houses of the early settlers, used as fences around kraals and waterholes. In the Peddie District of the Eastern Cape there are a number of these living fences that have been closely planted around waterholes to keep livestock from the water or to channel them to the entrance. The wood is very soft, spongy and light. Hollowed trunks were used to make canoes and troughs, and cubes of wood were used as floats for fishnets. When tarred, the wood made good roofing shingles. The African women of South Africa make the highly decorative seeds of Erythrina caffra into necklaces. Children also love collecting them where they are known as lucky beans. All coral trees produce a poison with a curar-like, and paralyzing action, which is used medicinally to relax the muscles in treating nervous diseases. The seeds of all erythrinas are said to be poisonous and the leaves of Erythrina caffra are known to have poisoned cattle. The bark of E. caffra is used topically to treat sores, wounds, abscesses and arthritis. Open wounds may be treated with powdered, burnt bark; infusions of the leaves are used as eardrops for earache; and decoctions of the roots are used for sprains. The Vhavenda use the bark for toothache. Erythrina alkaloids are known to be highly toxic, but the traditional uses strongly suggest antibacterial, anti-inflammatory and analgesic effects. More common are the uses as a garden plant. These trees are admirably suited for park planting or used as a tree to line streets of cities, small towns and villages. Fine specimens have been cultivated in Grahamstown and Graaf Reinet. In the Boland town of Worcester, there are beautiful specimens used to line Tulbagh Street in the front section of the town. There is also a delightful avenue of them near Port St. Johns where they are a splendid sight when in full spring flower and alive with birds. On lawns they make beautiful specimens as single subjects but one must be aware that in time these trees may become rather big and bigger gardens ultimately are more suitable.